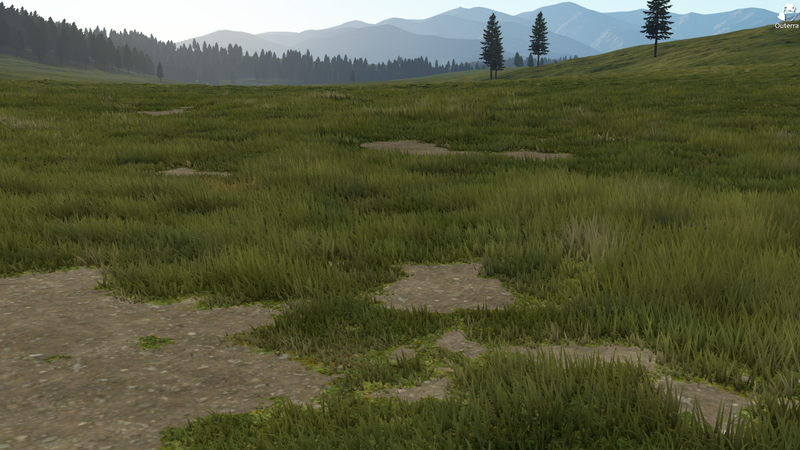 Procedural grass in Outerra is rendered in two stages. The first stage generates just a grass canopy, a height mask that produces the overall shape that the grass forms on the terrain. 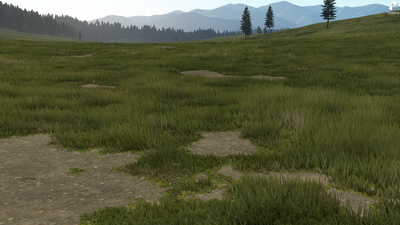 It generates dry grass-less areas as well as grass of varying height using fractal patterns. 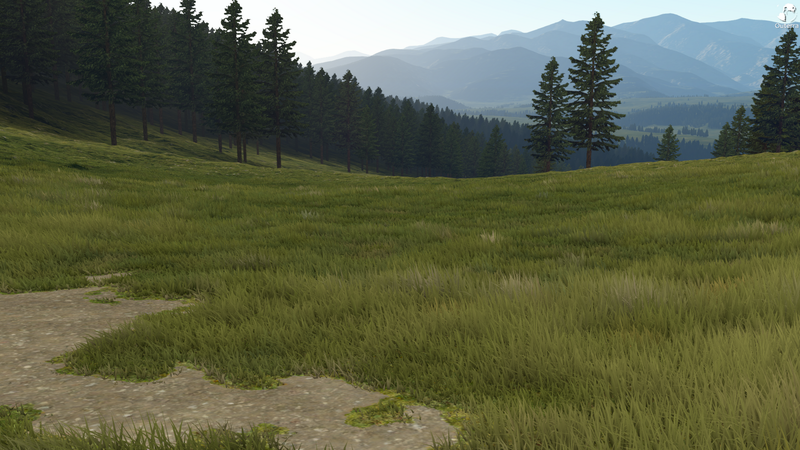 Output of this stage is also directly used when rendering the terrain in the distance; what you see out there is not the ground level but a procedurally textured envelope of low vegetation. 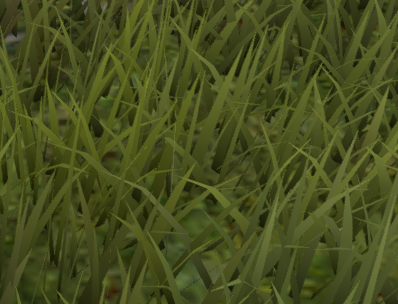 This also means that objects that are hidden in the 3D grass will be hidden under the distant canopy as well. 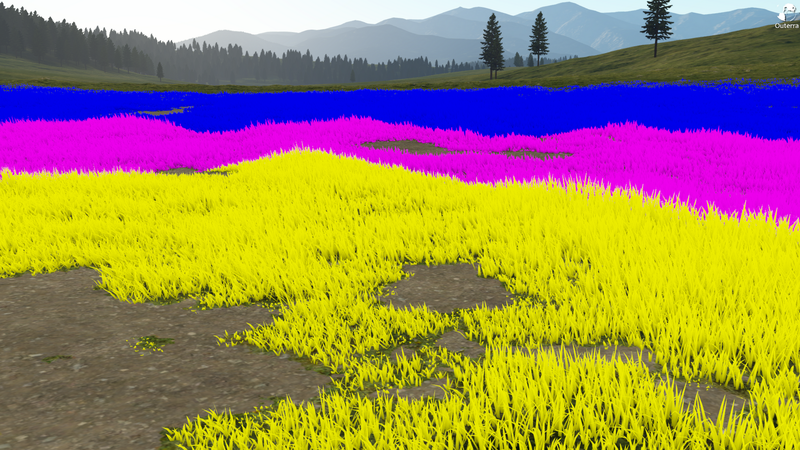 The second stage generates grass blades dynamically using the canopy data: terrain elevation, grass height and color. Canopy data have resolution roughly 30cm, and the amount of grass blades varies depending on the level of detail, that in turn depends on the distance from the camera. The algorithm generates each blade via a geometry shader as a triangle strip with 7 vertices and 5 triangles, making a blade with 3 segments. 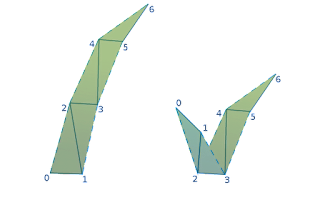 For short blades the 3 segments would be a waste, so in that case the blade is folded into a V-shape between the first and the second segment. This doubles the apparent density for the shorter grass, which is desirable since it doesn't cover the ground as well as the longer one. At the most detailed level there are 4 blades generated from a single point in the canopy texture. Each detail level halves the amount of blades, while also doubling the width of the remaining ones. Original patch of grass from which the blades above were extracted. Since the blades are generated individually, they can be also easily animated. Here's a short video where the texture normally used for ocean waves was used to animate the blades. Obviously it will need different parameters, but conceptually it works quite well. And finally, a longer video showing the grass rendering in motion. If I didn't have to earn money with my job i'd offer you my services for free (i'm a 3d graphist). I can't wait to share this world with friends over a multiplayer interface. With such virtual univers(al) creation you take much more risks than an EA or Ubisoft and as "consumers players" we just can thank you (15$ is nothing...) and tell you good luck for your... i mean 'our' unique adventure. You allow our mind to imagine what infinie big and small change ways of thinking. PS: sorry for my English speaking: I'm French. Very good work here. It's is very interesting to revisit the program every week or so just to see what improvements you've made.